I heard about BookBub from Book Marketing Mentors podcast with Susan Friedmann. BookBub has an gigantic mailing list of readers who love ebooks. Once a day they send out an email offering discounted prices on select ebooks. As soon as I could, I thought I would try it out. Here’s how it has gone so far. Signing up to BookBub as a Partner was easy enough! 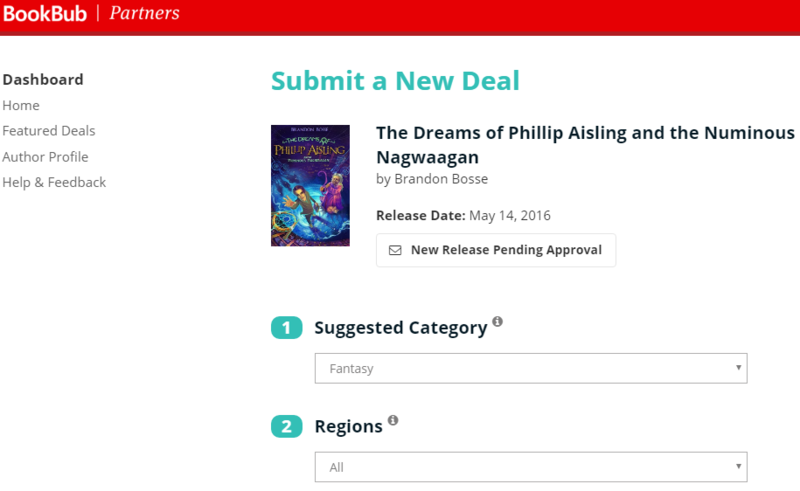 After signing up, you can submit a new deal for BookBub readers. This process was fairly straightforward as you can see. First you select your published book and then choose the category and region. BookBub has different numbers of readers depending on the category you choose and their prices reflect this. Check out their pricing page for details. Next you choose the original price and deal price. The estimated fee will depend on the category chosen in step 1 and your deal price. In general, the more readers they have in the category you pick the more you will pay in fees. And the lower price you offer as the special deal the less you will pay in fees. For example, I chose the Fantasy category which has nearly 2 million BookBub fans subscribed. 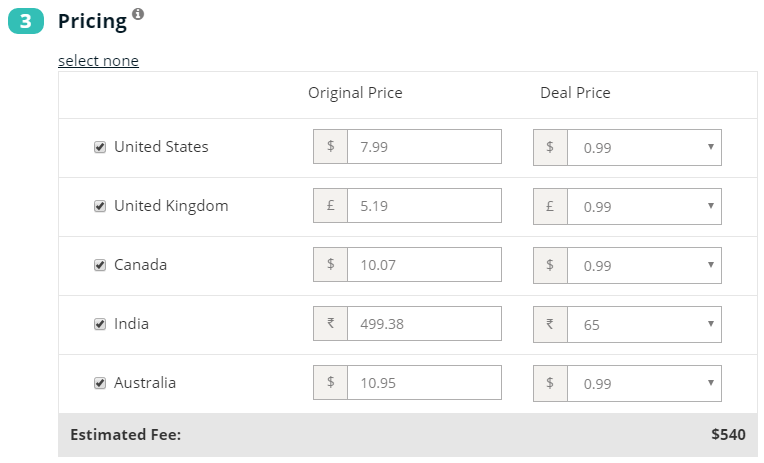 If I pick a deal price of $0.99 then the fee is $540 but if I set the deal price to FREE then it is $270. $540 may seem steep except that they state they have an average of 1810 purchases at the $0.99 price level. 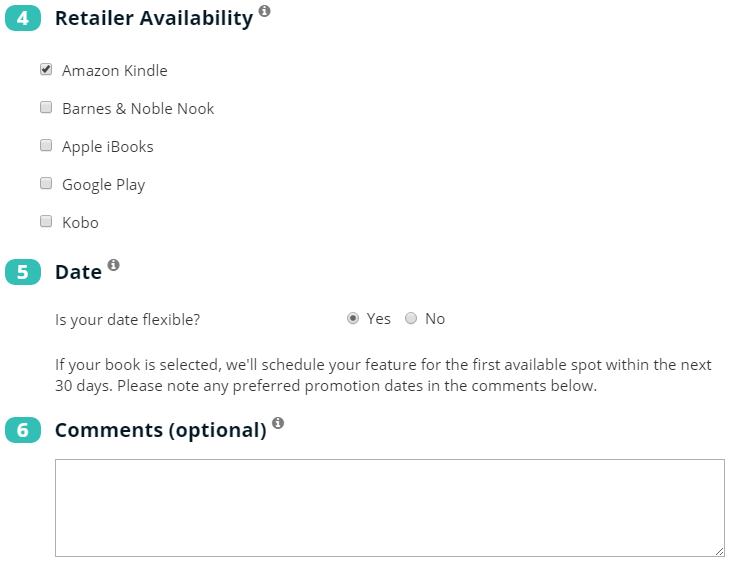 Amazon KDP royalties are 35% to 70% depending on where the book is sold. If the book sells 1810 copies at $0.99 and I earn 35% then that is $87 profit and a lot of publicity. Sounds good! But, little did I know that just being willing to pay $540 for an advertisement with BookBub isn’t enough! It turns out they reject the majority of their submissions! OH NO! How naive I was! But I am not deterred. I have read some tips on getting approved by BookBub review team by Shawn Inmon and Lindsay Buroker. I will try again once my book has some great reviews! Feel free to leave a review on Amazon here! Thank you!